Hualalai Hale is a family friendly vacation rental with an open-air floor plan created to emphasize a sense of sharing and ohana. The home is luxurious, yet cozy; the large lawn and pool is a wonderful place for families to gather and play. The Hualalai Resort itself is oftentimes thought of as the epitome of Luxury. Luxury, however, does not exclude the many family friendly options you can enjoy at the Hualalai Club. Activities range far and wide to interest your blooming athlete, your future scientist, or your dramatic artist. Below are a few of the many activities your kids can enjoy at the Hualalai Resort. One of the most popular kids’ events, the Kālā Pa‘a Gold Coin clinics highlight learning the basics of tennis while having fun. The pro sets out the target on the court. When the target is hit, she or he collects a coin for a job well done. Coins are redeemed for prizes. There are three specific levels: “Manini” for ages 4 to 7, “Honu” for ages 8 to 10 and “Future Champions” for ages 10 to 17. Since this program is so popular, we suggest booking before you get to Hualālai. 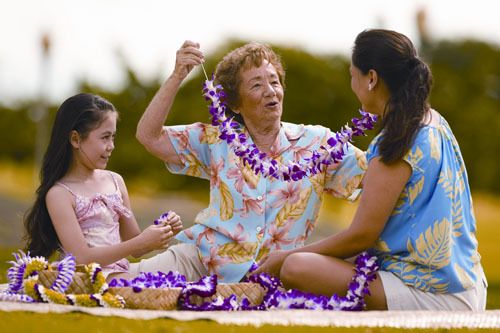 Learn how to string a flower lei. Share it with a loved one as a gesture of “aloha,” customary to the Hawaiian way. Dreaming of becoming a marine biologist? 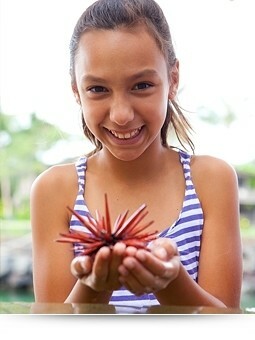 Make those dreams come true by spending part of your day with Hualālai Resort marine biologist. Participants will learn how to collect and record data about Hawai‘i’s unique underwater world. Great for kids that love science and investigating ocean life. (Reef shoes and water clothes recommended). These are just a very few activities available to members of the Hualalai Club, which can be included with your stay at Hualalai Hale. Rates are $50/day per person, and children under the age of 14 can participate for free. Please visit Hualalai Resort for more details.